Don't have $10,000 (about UK£6,464, AU$12,779) or more lying around to buy a gold-plated Apple Watch Edition model? That's okay, because a new service can make it look like you're a big spender for the same cost as Cupertino's cheapest wearable. 9to5Mac today published an unboxing and hands-on video featuring an Apple Watch with gold plating and a link bracelet costing far less than you might imagine. That's because the customized Apple Watch was bling'ed up by a new service called WatchPlate, who can turn even the cheapest Sport model into an 18-karat gold-plated beauty in only four business days for a mere $399 (about UK£258, AU$510). Better yet, these experts with nearly a century of combined experience at gold plating can make you look like a million bucks, complete with free round-trip shipping courtesy of FedEx. Naturally, spending upwards of $17,000 (about UK£10,988, AU$21,724) on an honest-to-goodness, 18-karat Apple Watch Edition does come with at least a few perks, such as the VIP treatment you'll receive from the Apple Retail Store or posh boutique you'll need to visit to buy one. 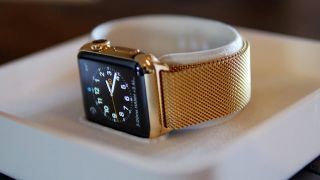 However, this third-party approach does have a few benefits: The gold plating is available in either yellow or rose gold (Apple's is only available in the former), and WatchPlate can even set you up with bands like the Link Bracelet shown here, a configuration unavailable to regular Edition buyers. The end result is described as "stunning" and "absolutely gorgeous" and the gold plating appears to have held up nicely after the first week of wear and tear, but the best part may be that you won't have to take out a second mortgage just to replace this customized wearable, should it get stolen by an unscrupulous thief.